How Does a Deluge of Data Effect Your Brain? SAP's in Memory Analytics vs Neteeza? In Readwriteweb: " ... Needlebase, a great new point-and-click tool for extracting, sorting and visualizing data from across pages around the web. I've been using it for all kinds of things and now you can too. When we first reviewed Needle here on ReadWriteWeb, it was in closed beta and new users had to request an account. Now it's open and available for all: free for personal use or by subscription for commercial use. Check out some examples of ways I've used this exciting new technology below ... "
◦acquire data from multiple sources: A simple tagging process quickly imports structured data from complex websites, XML feeds, and spreadsheets into a unified database of your design. ◦merge, deduplicate and cleanse: Needle uses intelligent semantics to help you find and merge variant forms of the same record. Your merges, edits and deletions persist even after the original data is refreshed from its source. ◦build and publish custom data views: Use Needle's visual UI and powerful query language to configure exactly your desired view of the data, whether as a list, table, grid, or map. Then, with one click, publish the data for others to see, or export a feed of the clean data to your own local database. Based on the examples shown this looks to be a very useful tool for scraping relatively modest amounts information from web pages and doing basic manipulation and visualization. Work experimenting with, as I am. Have not followed the Google small business blog very closely, but recently there is an interesting article: Now Available with Google Apps: Google Alerts. " ... Google Alerts is a content monitoring service that notifies you when Google’s search engine encounters new content - such as web pages, newspaper articles, or blogs - that you’re interested in from all across the Web. Simply enter your search terms and Google Alerts will notify you via email whenever Google finds new results that match your terms. To avoid information overload, you can configure Google Alerts to send one email per day or per week, compressing the most important results into a brief message ... "
In Technology Review, news that Nokia is developing a universal in-box that will collect messages from many smartphone Apps. Is this a good idea? Sometimes, but it is also useful to have input separated by its transmitting source. This is the kind of research we continued to look at in the innovation center. How do shoppers actually interact non-consciously with complex environments like the retail store. Read the whole article from the link. Back in early 2008, when Sands Research was incorporated after several years of R&D, the majority of our work was completing neuromarketing research studies on television commercials. We also began our annual Super Bowl Neuromarketing Study on ranking the most engaging spots during the big event. (See below for info on the upcoming 2011 Super Bowl Study). Since that time, our comparative database has grown rapidly with our Neuro-Engagement Score (NES) and Emotional Polarity Timeline (EPT) measures becoming increasingly accepted by the consumer insight community. Over this past year, we are seeing a growing utilization of neuromarketing services in shopper insight and sensory testing. With a portable EEG amplifier and Eye-tracking equipment in a small handbag or waist pack, our shopper participants have the ability to roam the aisle providing their unbiased, non-verbal feedback to focal points in their purchase decision process .... "
Google LatLong provides an overview of Google Earth 6. Based on this, the new update appears to be quite impressive. I have a particular interest in Historical Geo Mapping, and a number of new capabilities and data in this area are included. In addition new 3D capabilities, when you display streetviews, you can see trees in 3D. Yes you can, and I did it for years in the enterprise.
" ... The first place to find the right supply chain answers is to ask the right supply chain questions. The ability to do that in provocative ways has always been one of the hallmarks of my friend Dr. David Simchi-Levi of MIT, who is back with a new book that continues as usual to add substantially to the supply chain body of knowledge. It's titled Operation Rules: Delivering Customer Value through Flexible Operations, and while the book covers a lot of ground, there is one overriding theme: many companies don't do a great job of matching supply chain/operations strategies with their core business strategies and customer value proposition. Getting that right can lead to game changing market success ... "
One would have thought that opting out of providing information that you might think is your own personal business would be your own choice. Essentially socially neutral. But some of the recent experience from Germans opting out of Google Streetview seems to indicate otherwise. There you can blur out streetview images of your property, opting out of that service. A recent article in Concurring Opinions provides some detail.
" .... The following pieces are relatively new and speak a great deal to the rapidly emerging mobile space. We would welcome your thoughts. An industry report by the In-Store Marketing Institute sponsored by Catapult Marketing and Google Inc. Please take the time to comment on these important developments - Your opinions are important to us .... "
Colleague Steve King in Small Biz labs reports on Small Business Saturday and New Localism. " ... Today is Small Business Saturday, a promotion by American Express designed to get more people spending money at locally owned, independent merchants .... " . This effort was new to me, worth understanding. Read the article and put Small Biz Labs on your feed. An infographic on data visualization. Explained by the developers in Readwriteweb. A clever view of the topic as a Venn diagram, which is useful to take a look at as a statement of issues involved in visualization. I don't think that a set diagram specifically lends much to the interaction between the elements included. It might attract my attention, but will it be useful for further simplification? Reported in Engadget: the Benddesk, a workspace of the future idea that includes a flat table like structure and an integrated background area. All accessible with multi touch interaction. I have seen a number of demonstrations of multitouch interaction, but they are rarely broadly useful. Working with a business furniture manufacturer years ago there was talk of blending multiple spaces together to make them as interoperable and flexible as possible. For specialty uses perhaps, but better mobility would be useful. Includes a video. In the CACM: Excellent overview article. Lot of good information to make the case in the enterprise. This article describes research designed to measure the impact of the business value of wikis, blogs, podcasts, folksonomies, mashups, social networks, virtual worlds, crowdsourcing, and RSS filters—all Web 2.0 technologies. Properly deployed, they may well permit companies to cost-effectively increase their productivity and, ultimately, their competitive advantage; the research reported here includes results of interview, observation, and survey data-collection from select companies and industries primarily in the U.S. across six performance areas: knowledge management, rapid application development, customer relationship management, collaboration/communication, innovation, and training. ..... "
Newly updated with a redesign and lots of new information: The Supply Chain Digest. I am a long time follower of how historians and media address the history of computing technology. A new biography of John Atanasoff is now out: The Man Who Invented the Computer: The Biography of John Atanasoff, Digital Pioneer, by Jane Smiley. There is still controversy on this topic. There are some with axes to grind that are ready to wield them. When I looking at this topic in detail the 'J Prosper Eckert and John Mauchly' answer was the standard one to the 'who invented' question. In recently years the answer John Atanasoff has taken over. In part this depends on the definition of computer and its specification as a 'practical, general purpose, stored-program digital logic machine'. I see in Amazon it gets some rocky reviews, some of which are eyebrow-raising. Read them. I am awaiting a full read of the book. The current NYTimes review is particularly unsatisfying. In GigaOm: Interesting thought, but I have not seen this happening .. The nature of collaboration is changing, thanks to social media, a rising number of teleworkers and — most importantly — better broadband. Instead of one-on-one collaboration over distances and in offices, folks can now collaborate with multiple people easily. Earlier this week, I saw an awesome blog post by Bernard Golden, CEO of cloud consultancy HyperStratus, on how today’s communications tools are allowing people to collaborate easily over long distances, inside and outside the company, and in large groups .... "
Trade Promotion Optimization, or TPO, was born of trade planning management system gaps. The industry has recognized a short list of innovative consumer products leaders that have invested in trade optimization with demonstrated success as advanced econometric modeling techniques allow consumer products manufacturers to simulate the impact of proposed plans against volumetric and profit targets. But much has changed in the world of TPO during the past several years as it has evolved beyond promotions to include pricing and can even be inclusive of shopper insights. Due to expanding needs, the analytics that are inclusive of TPO have not been entirely clear until now ..."
I saw afterwards that they will not give me access without a 'major company' email address. Hard to get your word out that way. Can a rep of Demandtec send me a copy for review? Free publicity available here.
" ... PRFilter (Patent Pending) from RealWire finds the press releases journalists and bloggers want to see. It provides one tool to efficiently find stories out of thousands it aggregates each day. Its innovative, active interest technology™ builds a personalised profile of an individual’s interests from their own, or their publication’s, published articles ... "
An interesting survey and analysis by Pew Internet. As we might expect, wealthier people have access to more Internet hardware and software. Especially in an industry that changes these very rapidly. There is little catchup time. Those with more money can buy more books, making them more accessible, and hire tutors if required. That has not changed. Still, both libraries close to me have dozens of free desktop Internet hookups, and WiFi throughout. Schools also spend much on technology today. Technologies have further evolved to be much less expensive and accessible. My son pointed me to the clever design page of Kyle A. Koch: " ... an industrial design student at the University of Cincinnati's College of Design, Architecture, Art and Planning, known as DAAP. This is where I share things about design, technology, creativity, and everything else that catches my eye ... ". In particular see his use of Ponoko, a remote fabrication system that I have read about, but never really experienced. More about Ponoko. See his personal show room for Ponoko products. For example, a device for taking pictures of pages using an IPhone. Good idea for a holiday gift. Also a recent ReadWriteWeb article on Ponoko. A next generation shopping app, Barcode Hero is far more valuable than just a price comparison tool. It lets shoppers research products they are thinking about purchasing, gathering comments from friends and experts on those products and alternate products before they buy. ... Users become part of a community, scanning the barcode of products they like and adding their comments, which can be passed along to friends over Facebook and Twitter. Those that really become engaged can become the “king” or the acknowledged expert in a category. A Demo video is here. I have not yet checked this update out, but will in the coming days. Well worth a look. In HBR: Need for time for reflection in business. I agree, it is just not done enough, especially as the need to get things done continues to expand. " ... The most disruptive, unforeseen, and just plain awesome breakthroughs, that reimagine, reinvent, and reconceive a product, a company, a market, an industry, or perhaps even an entire economy rarely come from the single-minded pursuit of the busier and busier busywork of "business." Rather, in the outperformers that I've spent time with and studied, breakthroughs demand (loosely) systematic, structured periods for reflection — to ruminate on, synthesize, and integrate fragments of questions, answers, and thoughts about what's not good enough, what's just plain awful, and how it could be made radically better ... "
Udated data on digital coupons that we will release on Tuesday, November 23. In addition, savings printed or saved to a loyalty card surpassed $1 billion on Coupons.com and digital coupon network so far this year. In CACM: A writeup of a study that indicate that social media have positive effects: " ... Contrary to popular opinion, Facebook is making people more social, albeit in ways unique to the digital age, according to new research at The University of Texas at Austin. While the social network site—the most visited site in the world—is helping to close the social media generational gap, it's being used differently by men and women, and by current college students versus recent college graduates .... "
" ... I'm open to the hypothesis that cell phones, video games, and laptops are destroying the brains of our youth. But surely this idea is important enough to deserve more serious investigation than anyone seems to have given it so far. The constant ostinato of Viewing With Alarm somehow never translates into serious large-scale studies of causes and effects — which leads me to conclude that the whole thing is just ritual inter-generational hand-wringing ... "
GigaOm posts on an upcoming gamification summit. Using game style interactions to improve value. Very good recent piece on how HP and IBM use social media, with references to recent Forrester awards for social media by both. Have long been an explorer of visual programming. Writing logical processes without actual computer code. Writing computer code is often half mathematics and half paying attention to extreme details. My own explorations with visual programming indicated that it was often not as easy as it seemed. Because logic is often not as easy as it seems. A recent piece in Readwriteweb on the topic. I have been intrigued by how the IPad is being used in the enterprise. I have seen a few examples. Here are some others that emphasize the mobility and capabilities of the IPad. How is the IPad better than a laptop for these kinds of applications? In the HBR, a good short article on reinventing your personal brand. I think this notion can be overdone, but I like their suggestions. I just installed the newly updated Junaio IPhone App. The new user interface is far simpler and easier to use. Support for higher resolution screen. Good direction, though there is not much content locally. I will continue to explore the general experience. Much more here. Additional posts on Junaio. An excellent short article by always interesting Byron Sharp: Loyalty Leads Marketers Astray. A recent editor's pick in Admap. 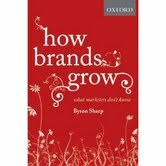 I also want to plug his excellent book How Brands Grow: What Marketers Don't Know. Must reading for marketers and merchandisers everywhere. Points out some little known errors of marketing logic. I reviewed this book, and have found myself going back to it for ideas a number of times since, a rare thing. See also, his informative blog. Forthcoming paper that looks quite interesting, " .... Which network structures favor the rapid spread of new ideas, behaviors, or technologies? This question has been studied extensively using epidemic models. Here we consider a complementary point of view and consider scenarios where the individuals' behavior is the result of a strategic choice among competing alternatives .... "
" ... In the real world, the random noise is often more subtle and various—a hundred little things rather than one big thing. But the effect is the same. Rewarding and penalizing leaders based on outcomes overestimates how much variance people actually control. (This works both ways: Just as good managers can suffer from bad outcomes not of their own making, bad managers can be rewarded for good outcomes that occur in spite of their ineptitude.) In fact, the more unpredictable an environment becomes, the more an outcomes-based approach ends up rewarding or penalizing noise ... "
A piece on the surge of prepared food in retail. Higher prices and profits, yet still an increased interest by shoppers for pre-prepared items. 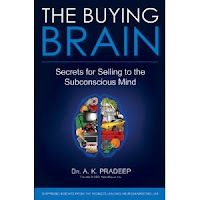 In Mind Hacks: a number of recently links in the general area of psychology and advertising. All of interest to the practitioner.
" ... on the benefits and byproducts of employing our semantic enterprise system. The style is an informal lecture lasting about 15 minutes, which explores the revolutionary leap that can be achieved in fully structured organizations. The byproducts are many, including crisis prevention and mitigation, higher levels of innovation, and much more accurate decision making based on far more accurate data. I would rate this video at the highest level of importance for decision makers in mid to large sized organizations, or those responsible for finding valuable content.... "
Another idea about machines merchandising to people base on sensors. I have seen a number of examples of this, but none that were successful. If they are too good, they are perceived as invasive. If not they are seen as jokes. We Can Store it, but can we Effectively Think about it? Cheap storage now allows us to store all that occurs in the Web. I have worked on projects that include using things like the Internet Archive to understand the evolution of specific changes online for decades.
" ... In a remarkable series of articles on the World Policy Institute's blog, Anais Borja introduces this distressing thought. "With easy storage made even easier by cheap disk space, our ability to create and save information has outpaced our ability to think critically about the theory and practice of archiving it. "Will this increase in materials force a democratizing of information and impress that on future historians or will it create an epochal informational garbage dump where real understanding will defy human and machine thought? ... "
We ran into similar roadblocks. We could find the screen shots of the web pages we needed. Yet these were raw data, and it was much more difficult to understand their context at the time. But is archiving of all this data possible? The Grocery Manufacturers Association (GMA) now has a new site and blog. My enterprise was a member and attended a number of their webinars, seminars and conferences over the years. In their blog they talk about their enhanced digital presence. This looks to be very nicely done, put it on your feed. Via Consumer Goods Technology .... Evidence of some excellent developments. Industry leader Procter & Gamble is pushing the envelope on enterprise collaboration, building a platform for its employees, suppliers and partners to collaborate, work together and innovate across geographical and departmental boundaries. In its journey, P&G is leveraging web 2.0 tools and social technologies to connect teams and individuals in a way never before possible; ultimately creating a new social fabric of collaboration in the enterprise. Collaboration, like Innovation & Transformation, is increasingly becoming an oft-used but seldom understood industry buzzword. While most everyone understands that in a web 2.0 world, collaboration is a function of tapping into the collective intelligence of "crowds" and forming a knowledge network; examples of how Consumer Goods manufacturers are applying this to tap into enterprise and supplier networks are few and far between. The tools and processes that constitute an effective social collaboration fabric for the enterprise. Thinking about differing architectures for casual versus power users of business intelligence. Having worked with executive information systems that needed to deal with this distinction, as well as the embodied ease of use issues, I found this quite interesting. Does the distinction need to be made at the architecture level? In the SASCom magazine, analytics is hot in the telecom industry. You don't have to tell me that, it should be hot everywhere. “While [data analytics] has always been exciting in the realm of revenue assurance, it is now moving to the forefront for those in charge of marketing, product development and customer care” by Martin Craener of SAS. Download squad shows a way to watch a video with friends using Youtube Social. I can see this also being used to rate a commercial with a group of consumers, or as a means to work with a group of colleagues on a video based project. Facebook based. Some interesting points here about SAP and Netezza. Set for release in November. More than a dozen corporations representing hundreds of billions of dollars in global commerce are working together to address a growing need for accurate product information accessed via mobile devices and the Internet. The Business to Consumer (B2C) Alliance is announced by its facilitators, GS1 US and GS1 Canada, not-for-profit organizations that are part of the global GS1 standards body. The alliance is composed of representatives from leading product brands, technology providers and retailers. The current list of participants includes: AT&T; Cisco; The Coca-Cola Company; IBM; The J.M. Smucker Company; Johnson & Johnson Consumer Group of Companies; Kraft Foods; The Kroger Co.; the Massachusetts Institute of Technology's Auto-ID Lab; Microsoft Corp.; NeoMedia Technologies; PepsiCo, Inc.; Premier healthcare alliance; Procter & Gamble; and Scanbuy, Inc. ..... "
In the Forbes blog. Excellent article on the open source R statistical package. The visualization capabilities are emphasized. I agree that it is the package you really have to have on hand and know for statistics. It is like a Wiki for statistical data manipulation, always being added to by researchers. So it acts as a community for statistical research. It is also being used increasingly in the enterprise, where they can expect to see job candidates trained in its use. At the same time, it does require programming skills to use effectively, so it is not a tool to be used by most managers directly. In Progressive Grocer, an overview article on the increasing use of digital coupons, with quite a few useful statistics. With the increasing use of smartphones, often mentioned here, the ability to acquire, organize and map coupons to buying history will continue to grow, How CPG manufacturers and retailers use these changes will depend on the kinds of analytics available. There is much opportunity there.
" ... Research shows that digital-coupon use has increased 59.9% for the year ending Sept. 30, compared with the same time frame last year. The number of companies offering digital coupons has gone from 217 to 267. "Digital coupons are becoming a core component within the overall promotion mix for consumer packaged-goods manufacturers," said Mark Nesbitt, president of Kantar Media. ... "
In Ars Technica, an article about the many privacy settings available for Google users. I use many Google services and am concerned about the privacy I give up when using their services. Google is reemphasizing the control that you have over their sophisticated capabilities, and this article is a good introduction to your options. In the CACM: Sandia Labs will be delivering a new proposed set of standards for Supercomputing today which is more closely related to the kinds of tasks that are usually done using supercomputing power. " ... 'By creating this test, we hope to influence computer makers to build computers with the architecture to deal with these increasingly complex problems," says Sandia researcher Richard Murphy. Rob Leland, director of Sandia's Computations, Computers, and Math Center, says, "The thoughtful definition of this new competitive standard is both subtle and important, as it may heavily influence computer architecture for decades to come." ... '. The article contains considerable additional detail. Thr Brandery launches six new startups in Cincinnati. In Dave Knox's blog. "Japan, Inc.," considered a leader in business expertise in the 1980s, has the potential to return to its former prominence. The problems that Japanese business leaders face today are not rooted in inherent societal or economic inhibitors. Rather, the main barrier to new growth is structural – a situation that can be remedied by a reexamination of individual business portfolios to enable the generation superior performance. ... "
A good piece on the very idea of the human network. Remember us? I think there is much to be said for linking together human and Internets in new ways. There have been many attempts, but none that I would call really successful. It cannot all be about algorithms that winnow knowledge ... clever humans can also contribute. An article in IEEE Spectrum showing robots doing common household tasks inspired me to think again about our own experiments with robots in the enterprise. Like any manufacturing company we had been using robotic systems in plants for years. We had also been experimenting with artificial intelligence, and included these ideas in how a robot might directly help the consumer. There had been work with academic groups to figure out how the technology could reasonably be applied to do those mostly unpleasant tasks in the home. Doing the dishes, folding clothes, cleaning surfaces, etc. Technology vendors wanted to help. Since we made some of the products that support those tasks, why not? Early examples of specific task helper robotics were interesting, and we allied with them. They are still out there, notably the Roomba. We worked on related 'intelligence' for these kinds of devices. Some of the results were remarkable, but typically also relatively expensive. Accurate sensors were also an issue. Further, in work with consumers we found that there was interest, but they want the devices to perform the whole task, not just a small piece of it. The added complexity of the robotic device made it of interest to the Geek in some of us, than the person that had to do the unpleasant task. Still looking for the robot butler. This is a pretty remarkable development: " ... With the release of Mathematica 8 today, the single most dramatic change is that you don’t have to communicate with Mathematica in the Mathematica language any more: you can just use free-form English instead ... " . See their full description here. Having worked with natural language input specification, I know how imprecise it can be. So I remain skeptical here. Certainly worth a good look. Does this mean that non-mathematical analysts can now use the package? In the Chronicle of Higher Education. An interesting study, but this could likely encounter the 'causal fallacy'. It is likely that many other aspects of context are involved beyond Twitter. Google announces that versions of the Android mobile operating system will include NFC (Near Field Communications) support. NFC enables short range, about 10 cm, communications between devices and also between devices and RFID chips. It is primarily designed for mobile phone use. We examined it for payment and providing information at the retail shelf. Having it integrated into the mobile phone operating system could make identification of precise location and touchless identification of products far more common a sensor option. This is a clear step towards the mobile phone as a wallet concept. I have been a user of Gmail for years, and find it very serviceable. When people try to contact me with Mail systems within other packages, Linkedin comes to mind, I always request people to use a regular mail package. Using some other approach just makes things more complex. Now Facebook is reportedly planning to set up their own mail system. More about it here. Please contact me via my Gmail address only. Shopalong research consists of a retail and CPG executives visiting a store incognito and seeing their venues the way a shopper sees them. A good AP article on how local Kroger CEO Dave Dillon does this. This can also be done in conjunction with models of real stores, whether they be online, or are innovation center layouts. These models can be used to understand how a retail venue is or should be working. Then the physical shopalong can be used to test the theory in the real store. We continue to seek the behavioral understanding of contextual spaces to further improve the experiences they seek to achieve. In Readwriteweb: Wikipedia is seeking $16 Million to remain a free service. Here is the direct appeal from Wikipedia. Certainly the most successful public wiki service and well worth that amount. That is about 20 US cents per unique visitor per month. Lots of other interesting current stats about Wikipedia in the article. I continue to think the WP is a great idea, although similar ideas for knowledge acquisition we attempted in the large enterprise were not successful. This list is fairly obvious. It is interesting to think about what markets the smartphone is changing markedly. In the end it is all about have a small, powerful, easily updatable, portable computer, wirelessly connected, with an increasing array of sensors. A good review of the new book: Numbers Rule Your World: the hidden influence of probability and statistics on everything you do , by Junk Charts blogger Kaiser Fung. The book, which I have yet to see, is an overview of statistics for the non mathematician. On my list of books to review in more detail. I think it is very important to have books of this type for the management decision maker. Especially important as more statistical analyses appear on dashboards. On displays of these types I often got the question: Explain to me again how much I can trust this analysis? I was the enterprise's representative to the well known Santa Fe Institute for several years. Was always interesting, sometimes directly useful. Mark Montgomery of Kyield comments on SFI as an innovation organization. And some of their current difficulties. Insightful. Visual graphic data design guru Edward Tufte's library of design resources is being auctioned by Christies on December 2. Retinal implants at the newly discovered Singularity Hub blog. I have my doubts about broad singularity type predictions, but this blog covers lot of related topics that are useful. Good Sloan Review article on analytics and value. I agree, of course. Build key processes into your enterprise to integrate analytical methods. The data is there and growing. Use it. VenueGen was just brought to my attention. I like the aspect of actually tailoring the venue to the specific meeting need. Constructing a relevant context. I know that can be done in physical space, can it be effectively done in a virtual one? See also their blog.
" ... VenueGen is a browser-based 3D immersive internet meeting platform where business colleagues meet, collaborate, share and present information in board rooms, training rooms, and meeting halls. Users simply select a meeting room, upload their content, and instantly enter a virtual room with directional voice where they can hear colleagues around the room! Engaged, active and immersed attendees communicate, make decisions, learn faster, and are more productive than with online alternatives. No more boring conference calls, no more travel, and no more expensive, complex video conference systems ... " . See also, Teleplace, which I have written about here a number of times. With a similar focus. In Junk Charts. A good example of how a visualization of data can be overcomplicated. A simple line chart is often much clearer, but avoided simply because it does not look artistic enough. You can attract people to see a chart with flash, but will they understand the real data being shown? Also, think twice about using pie charts. In GigaOm: Half of US consumers to use a smartphone by end of next year. It is moving quite quickly and the implication for sensors in the hands of consumers continues to grow. Doug Lautzenheiser posts about IBM blogging. I talked to IBM's social media manager five years ago and was very impressed even then by what I saw. Their white pages automatically had a placeholder for blogging. They made it very easy to get started. Not everyone there blogged, but they had started many blogs with many subjects. They used social, non work topics to connect IBM people worldwide. Anyone out there have a access to any studies of how well their capability improves the working environment? This blog has been kindly mentioned in the Business intelligence software blog by Doug Lautzenheiser. Thanks! Put his excellent blog on your feed as well. Walgreen is responding to the changing health care landscape by becoming "a retail health and daily living store," CEO and President Greg Wasson told investors. He said the stores are positioned as the "new [health care] provider," noting that opportunities "are more focused on the prevention and management of chronic disease, and that's where we are headed." .... "
In 2007 I got to see the operation of a Pop-Up store in action in Columbus, Ohio. An impressive mix of display, merchandising and interaction for the Swash brand. I was particularly intrigued about how they could be used as satellites of innovation centers, but with the added benefit of having real consumers able to wander in and provide more spontaneous, less scripted interactions. Lots of data could be gathered to understand new initiatives as they evolved. Less successful was the inability to easily adapt them as new ideas were proposed. Good article In Bloomberg-BusinessWeek on the topic of: The Staying power of Pop-up Stores. It is satisfying the the ideas is still prospering in concept and delivery. The article contains some good current examples. Learning how people make mistakes and using that mined information to determine the best way to teach them. I was an early user of Spotfire in the enterprise. Now it is good to see that they have modified it to the point that it can be used on an iPad. I have been hearing that there are major efforts underway to get executives to use IPads as Business Intelligence platforms. That is great, but based on my own experimenting in this space the content is more important than the device. So the Spotfire direction is great, just make sure that there is enough value to make the underlying device useful to carry around.
" ... Our joint case study with Adobe illustrates the highly differentiated benefits of a very targeted approach to social media marketing. eCairn stands behind the belief that the future of the web is tribes ... "
The idea of putting an microchip in a pill has been around for some time. This is the first time I have seen the implementation getting close. There is concern about the privacy of the personal data being transmitted. From Novartis. I got a note the other day that announced my local library was starting to lend e-books, and even loaning out e-readers. That made me think, what do the publishers think about this? There have to be some restrictions. Yet e-books are a natural resource for those that cannot come to the library. Discussed in more detail in Readwriteweb. I have looked at aspects of retail checkout for some time. Examining methods like RFID tagging, in store hand held scanning, carts that scan their contents and replacements for the checkouts themselves. We experimented with all of these in the innovation centers. Worked with companies, like IBM, Motorola, Fujitsu, Nixdorf and NCR. The entire idea has come a long way. In my local Kroger there are now lines for the self-checkouts, unusual just a few years ago. A good overview of the values and minuses in the Washington Post. Non-technical, with some useful statistics. A good overview piece in E-Commerce Times on recent developments in social media law. Mind Hacks informs us of what looks to be a new and useful neuroscience blog: Brain Detectives. For those interested in the topic of augmented reality, I suggest subscribing to Metaio's Augmented Press Newsletter. Largely commerical examples that Metaio is working on with partners of all kinds. An indication of what can be done today, with related videos. A significant percentage of US homes don't see the need for the Internet. Ars Technica reports on a US Commerce department survey/study. Highly surprising. The GMA has reported in a recent study that shopper marketing (aka merchandising) is booming. More in a recent Progressive grocer article. " ... 83% of CPG companies say they will increase spending on shopper marketing, and 62% of consumers say they check online for deals before at least half of their shopping trips. "Shopper marketing presents boundless possibilities for reaching consumers in new and innovative ways," said Brian Lynch, GMA's director of sales and sales promotion ... "
Update: And more on the idea here in Adage, with mention of rivalry with digital and work by P&G. An interesting development showing P&G's interest in healthcare delivery. " ... Healthpoint Services is a small startup with a big goal: transforming rural healthcare for India by delivering a one-stop shop of pharmacy, clinic, tele-medicine, and clean drinking water. The global branded product company Procter and Gamble (P&G) has a goal of its own: to reach another 1 billion consumers by 2015. Now the multinational and the startup are working together to reach both their goals in a newly announced partnership to improve and scale the Healthpoint model in India..... "
Is it possible to eavesdrop on a daydream? Is this a byproduct of the long awaited brain computer interface. In IEEE Spectrum. Quite interesting piece in ReadWriteWeb. Consulting is by its nature a complex and expensive venture. It can price itself out of the needs it seeks to deliver. It does often consist of the buyer paying for a great deal of hand-holding. That overhead is very large. So why not break down things that need to be done into App size pieces? Tailor them as needed? I like the idea, but it also sounds somewhat like something we pushed in the early 90s, expert systems, aka Artificial Intelligence. The article does give some excellent examples of service firms that are getting into tailored application development, in business intelligence and elsewhere. Worth it to ponder this direction. I met today with Doug Lautzenheiser of Partner Intelligence. " ... general manager of BI services, has over 20 years of experience in the industry and has served organizations such as Procter & Gamble, JPMorgan Chase, Wendy's International, Omnicare ... ". More about Doug in the Global CIO blog. I was impressed by the kind of fundamental IT capabilities they deliver. Values I could have used from the very beginning in the enterprise. For example they have developed a means of intelligently scanning and converting legacy software to make it more reliable in the modern enterprise. Doug also has deep knowledge of the use of business intelligence today. Security guru Bruce Schneier suggests that the recent bomb plots could mean the end of in-flight Wifi. His blog can be very interesting in security topics. Certainly in a traditional sense the user interface should not surprise the user? But here is a refreshing contrary opinion. Via the GMA Smartbrief. This reminds me of our own work with the long silent Mr. Clean brand image. I was part of a team that made Mr Clean get a personality and start to talk. He had been speechless since his debut in 1958. He spoke for a few months in the 90s, using an AI brain, in advertisements and online. Then, without any explanation, he stopped speaking and went back to his original supportive but quiet self. Maybe we should have used a celebrity voice? I note that an otherwise excellent Wikipedia article on Mr. Clean makes no mention of this episode. Now Reading: About Face: The Secrets of Emotionally Effective Advertising by Dan Hill. Notably in chapter 4 he talks about focusing on faces. This is a particularly useful overview of how important faces are in advertising, whether on line or in other signs or media. This is topic we studied extensively and had long time historic, but hardly scientific use in consumer package goods. The topic is well known, but rarely covered in detail. See the section on 'true smiles' vs 'social smiles': How heartfelt smiles differ from willed ones. I would further like to see how these can be detected using neural scans in more detail. Overall a very good overview book, the topic is rarely covered in one place. Continuing to read. I see the author, Dan Hill, is from the consulting firm Sensory Logic, which is also worth a look. Report of using a barcode based payment method via a IPhone at some Starbucks. Once you have set it up you can use it to pay your bill via a displayed barcode. Case study of the movement towards smartphones as wallets. Mark Montgomery of KYield on Transforming the Enterprise. Read the entire newsletter at the link. He provides his personal answer to the question: How can information technology improve health care? And relates his journey towards the design of a semantic health care system. I recall reading USN&WR long ago and though I have dropped looking at it over the years. I did have a fondness for it its existence. That was not sufficient to keep it alive. Now it will soon go into digital oblivion. At least initially for mailed distribution. Another example of the decline of print? I see that the Google 411 service is about to be dropped. I had become accustomed to the ability to do accurate hands-free local phone connections using it. It was particularly useful when traveling to get local connections. Also useful at the health club. The NY Times article also indicated that a number of blind and visually impaired users had been using it as well. It also implied that Google was using it as a 'honeypot' to gather speech phonemes. Getting too attached to any Beta service is a mistake, yet we have gotten used to doing exactly that. and Google has the right to pull it as they require, but it is net annoying, Still, there is Bing 411, and other alternatives. New to me in ReadWriteWeb: A new data visualization language for non-programmers. With the odd name: Impure. The language is completely visual in nature. It's site is here. Have not looked at it yet, but will, and will post more if it merits it. ..... " .... a simple programming language for data visualization and art, Impure is a completely visual language - there's no need to learn any code. The programming language is also completely web hosted - there is no development environment to install. It's sort of like Yahoo! Pipes but for visualization ... "
Very interesting article at GigaOM. Google has changed some of its API agreements to try to force more data sharing between vendors. This could make for more sharing of the social network data now held closely by companies like Facebook. Is this good or bad for the average user or vendor? GigaOM does a good job of laying out the implications. Colleague Walter Riker pulls together some good comments in his always interesting Ease of Blogging space. Worth putting on your feed. An IPhone App called Always Me, that tracks Ovulation from P&G. As might be expected, also markets Always feminine protection products. At a local Business Intelligence meeting I met Crystal Thies, of Crystal Clear Buzz. She does social media strategy. In particular I liked some of her thoughts and insight on the effective use of LinkedIn. Based on conversations I have had with users of LinkedIn, its use is often considered a mystery. Checking with her is a good first step. Meijer has decided to get into the chainwide e digital TV network with PRN, following a number of other large big box chains. More chances to influence the shopper. In today's Fast Company, a good article about how neuromarketing is being used to improve political traction. Makes perfect sense. In a emotionally laden context, it is even more important to know how people non consciously think about their decisions. Here too I suggest that the practice of what has come to be called Business Intelligence is becoming key to how this kind of data is being used. A topic I am currently studying. Long suggested, but still not here. Some steps in the right direction described in Technology Review. Is it really required to do rich communications? I have been of the opinion that it is necessary only if you need to share very detailed representations of something that needs to be shared in real time. I might change that view if I could experience it. I just took a quick look at the ShopSavvy barcode scanning app on my IPhone 4. I had reviewed it previously versus RedLaser. The new update and user interface is far easier to use versus previous versions and works quickly on all of the barcodes I tried it on. Previous versions were not competitive. It is now worth a complete comparison with other Smartphone camera-based scanners. Pass along any reviews you might have done. Retailer Carrefour is offering a self-scan mobile personal scanner device for shoppers in Beligium. First I have seen Carrefour do this. I still think that the future of this kind of capability is in the use of Smart Phones that can scan through their camera. That capability continues to improve. An interesting and informative piece on the direction of augmented reality ideas. I do see this as a kind of application, especially in retail, that we will see more often on the mobile platform, since we can choose our reality easily there, and it makes sense to add information as required.
" ... As much as 95% of our decisions are made by the subconscious mind. As a result, the world's largest and most sophisticated companies are applying the latest advances in neuroscience to create brands, products, package designs, marketing campaigns, store environments, and much more, that are designed to appeal directly and powerfully to our brains. • Building stronger brands that attract deeper consumer loyalty .... "
In the IEEE Spectrum. An insightful article about how to make a humanoid robot dance. I am not sure the goal of any robot should be to make a robot more human, but the challenge is interesting in itself. The Donut chart is discussed in the Junk Charts blog. A donut chart is a kind slightly re-designed pie chart. I agree that this could have been done much more simply. The author talks about the misleading interactive aspects of the chart. A good visualization case study. Imagine a tool that is a cross between a powerful electron microscope and the Hubble Space Telescope, allowing scientists from disciplines ranging from medicine and genetics to astrophysics, environmental science, oceanography and bioinformatics to examine and analyze enormous amounts of data from both "little picture" and "big picture" perspectives..... "
" ... I wanted to share with you the iPhone App which I have completed and now available at the Apple App Store at: http://itunes.apple.com/us/app/wuss-2010/id384385872?mt=8. This will help you easily search for a specific paper and review the abstract and read the paper. The only feature I that will be removed from the initial release is entering review comments per the conference chair's request. You can also find a video tutorial of the iPhone App at: http://www.youtube.com/watch?v=M_aZa0XHAls. I am in the process of finishing the iPad version but perhaps it will be available at the Appstore for SAS Global Forum's version in Las Vegas ... "
Walter Riker takes a look at the Smart Phone market and what it might mean. There is no doubt that will all be armed with powerful mobile computing soon. Good job, Walter.
" ... What determines whether decisions happen on the bottom, middle, or top rung of the corporate ladder? New research offers a surprising conclusion: The answer often lies in the technology that a company uses. Information-based systems, such as Enterprise Resource Planning (ERP) software, will push decision-making toward the bottom of the corporate ladder. Communication systems, such as e-mail and instant messaging applications, will push the decision-making process toward the top ... "
Doug Lautzenheiser, a leading subject matter expert in the use of Business Intelligence software within corporate organizations, takes a look at Forrester's reporting on business intelligence (BI) within the enterprise. Useful list of who is playing and how they are doing with links to complete reports.